Details of the High Park fire site in northern Colorado – down to the last standing trees and bushes – will become available to environmental rehabilitators in early 2013. It promises to be the most extensive study of a large forest fire site ever done in the United States providing data for local officials to target their restoration projects to areas most in need. The High Park forest fire burned over 130 square miles of mostly remote woodland along with over 250 homes this past summer. It's an area so large that until now, it would have been almost impossible to gather data for the whole burn scar. Late this summer after the fire was out, scientists documented the region from the sky in hopes of targeting the areas most in need of restoration to avoid continuing post-fire problems like erosion, mudslides and contaminated water supplies. "It's unique," said Schimel, a principal investigator at the National Ecological Observatory Network (NEON). "We've never had this kind of detailed information before." The scientists flew over the burn site in August with among other instruments high-resolution camera shooting through the bottom of a Twin Otter plane to take detailed images of the entire fire zone and a LiDAR, a remote sensor that can measures distance by using light, providing scientists with a 3-D representation. "It is just amazing technology." said Schimel. "We are going to have very fine scale images of the charring of surface materials," said Michael Lefsky of Colorado State University who is partnering with NEON on this project. "We will be able to pick up very, very small objects and just get a sense for fire impact say at the soil level or how much of a particular crown was burned." If the pictures show a certain area has major erosion, for example, that may lead to mudslides that would block a road, the forest managers can prioritize that area a priority for planting grasses to mitigate the problem. Officials from Fort Collins, Colorado, should receive their first set of information from the flyovers in the next few weeks according to a spokesman for NEON. Scientists are also comparing those images to satellite photos of the flora taken prior to the burning to try to learn why the fire destroyed parts of the forest, while leaving other areas in tact. "You have patches that were absolutely consumed," said Lefsky. "Whereas right next to it you can have a transition where needles became scorched but it's unclear whether the tree will live or die. And then you have a patch right next to it that was not touched at all." They hope to determine what impact the pine bark beetle destruction of trees may have had on the fire's movement. The beetles bore into tree trunks and many believe make the forest more flammable. This is the first large scale fire in the High Park area since a major pine park beetle infestation began in that area about 10 years ago. "We have satellite images from before the burn that will allow us to determine where there was bark beetle and we've got this imagery now that is going to show us burn severity," Lefsky said. 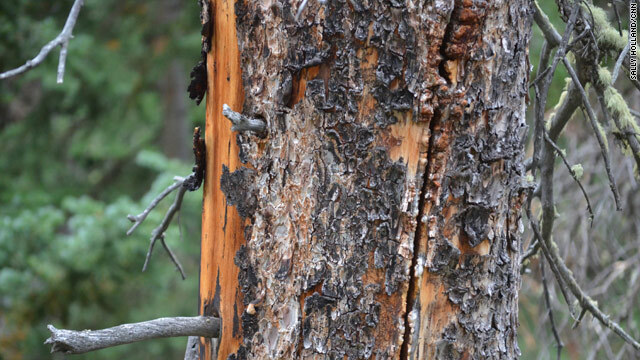 Scientists will be able to compare the before and after images to see if the bark beetles played a part in the fire destruction. For the long term, the scientists hope to re-image the area in five and/or 10 years to see what they can learn about the forest recovery based on the pre-fire conditions and the burn severity, said Lefsky.